Well, Week 2 is finished. It was a bit of a challenging one again. I'm finding I need to have a small pool of ideas to work with on any given day, because my plans and schedule can easily change. A friend suggested different categories and doing something from each category every week. I've been working with that and putting my ideas into categories (there's currently 10). I'm hoping I can use this strategy to plan and add variety to my weeks. That way you're not seeing too much of the same thing all the time, and I can balance my ideas out. But, without further ado . . .
January 8: I learned why your eyeballs don't freeze when it gets really cold. I saw this link on Facebook and thought it would be cool. It was pretty interesting. You should read it too. So, yes, the weather has been freezing lately, but don't fear. As long as you're alive, your eyeballs will be okay! January 9: I ate a slice of pizza upside down. Meaning, the pizza was upside down, not me. 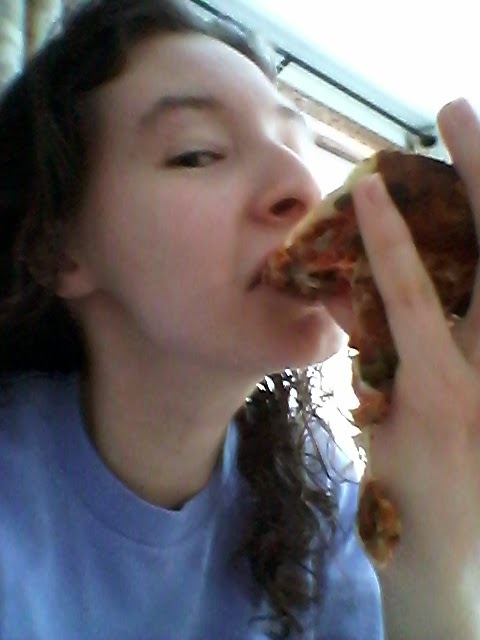 In my 23 years, I have eaten pizza many different ways. For a long time I ate it crust first and worked my way to the point. There was a time as a kid when I peeled off the toppings, ate those, licked off the sauce and then ate the rest. I think that grossed out some other kids at school. I have eaten it with a knife and fork. When in New York, I learned to fold it and eat it New York style. 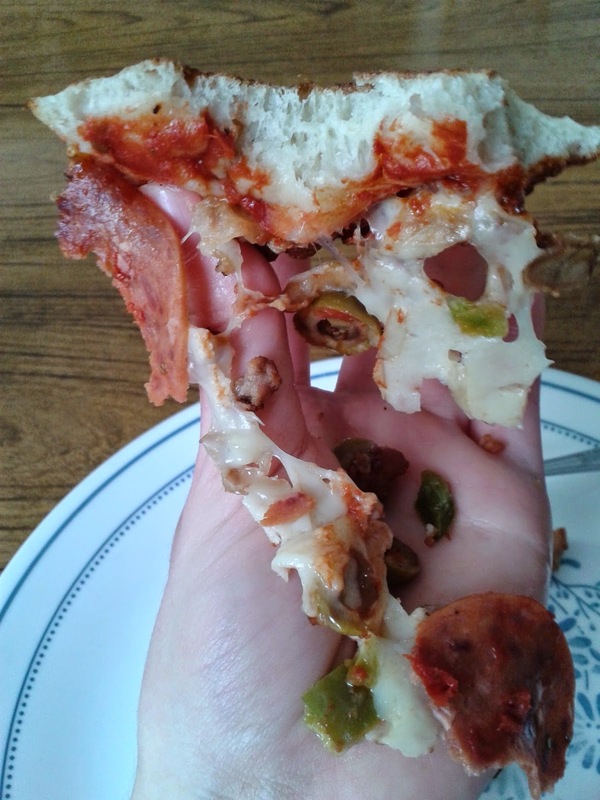 But, I had never turned over my pizza so my toppings faced my plate and tried it that way before. It was tricky figuring out how to hold it right. It wanted to fold over at first. Starting out with eager anticipation! I'm starting to lose it! 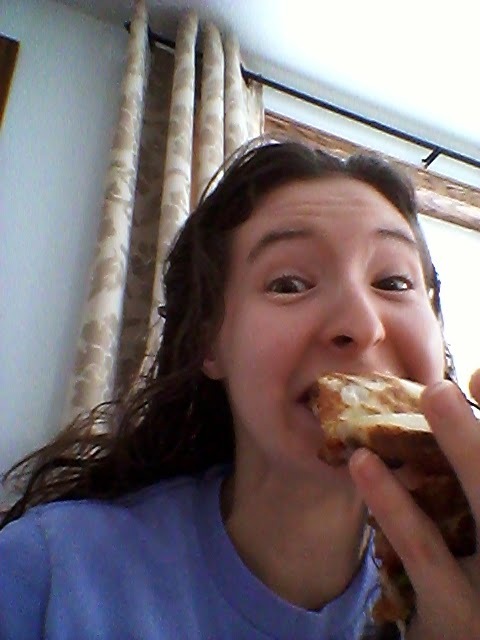 And then I was taking pictures and texting while eating it, so that made it a little more interesting. Getting close to the end! I had to resist the urge not to turn it over and eat it the right way. Fun, but I'm not switching permanently to this new method. There were some casualties left on my plate afterward. January 10: I went to watch a hockey game for the first time! I used to watch Hockey Night in Canada all the time, but that doesn't count. Now I work at an arena, and when I'm not busy, I'll watch games from my concession or from the lobby, but I had never paid to get in, sat in the bleachers and watched a game. 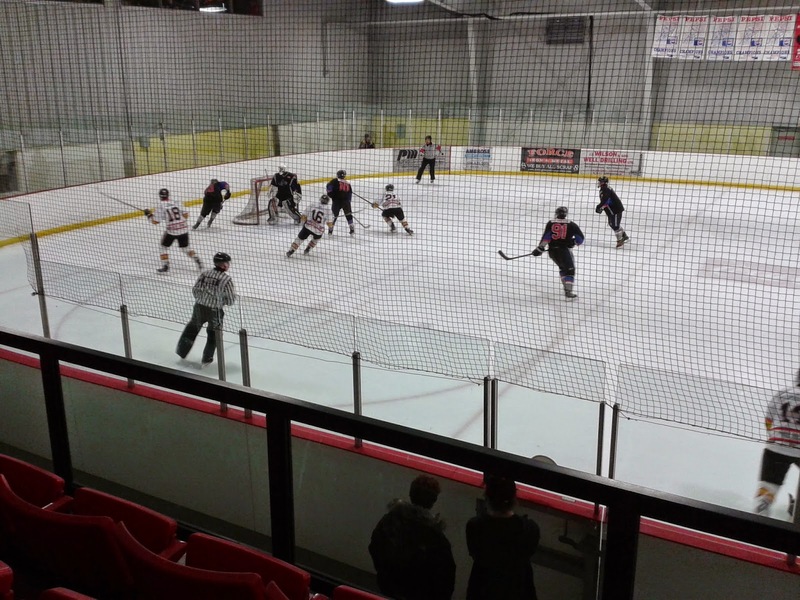 So Saturday night, I went and watched our "Junior C" team play. Most of the time when they're playing at home, I'm home or working at the concession, scrambling through intermission rushes. If I was going to go to a hockey game, I wanted to get the full experience. 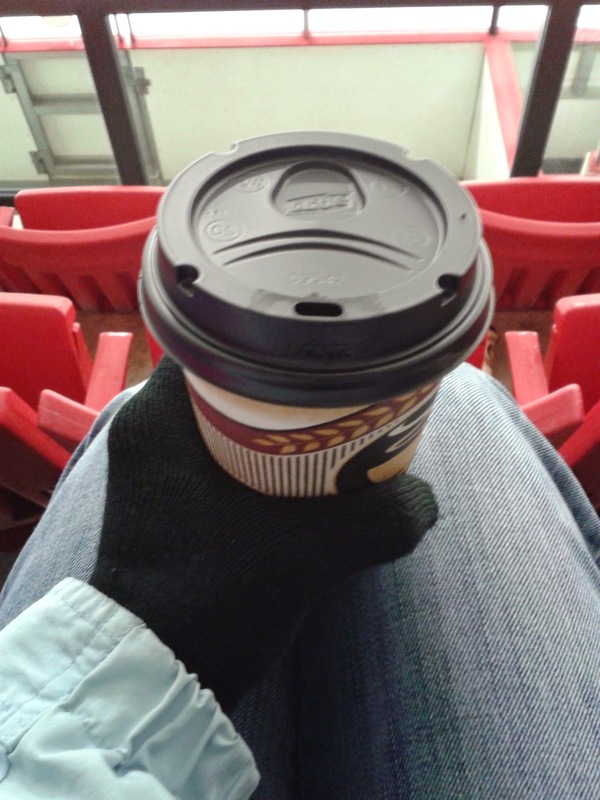 I froze through the first period, and at first intermission, I went to stand in line at the canteen like everyone else for a half coffee, half hot chocolate. This helped keep me warm. At the second intermission, I had to go get popcorn and put the dill pickle seasoning on it. It was a good night. January 11: Sunday was a little more low key. I went to visit a local church where I hadn't been to before for a service. It's good to get such experiences sometimes and worship with other believers. I also tried a new smoothie combination. Vanilla yogurt, frozen mangos, banana, strawberries, and orange juice makes for a good tropical flavour. I made another one the next day again for work. January 12: Well, the cold, snowy Monday morning started again with my trip to the pool. It was a productive swim class, which I know because of how sore I was after. I learned that if you wipe the inside of your swim goggles with spit, they don't fog up! Who would've thunk?! Afterwards I headed to a music store . . . to shop! I've only ever been able to admire in one of those stores. Monday I let loose and got some new tools and music for my flute practice. I walked out with a music stand, metronome, maintenance kit, music and a whopping bill! 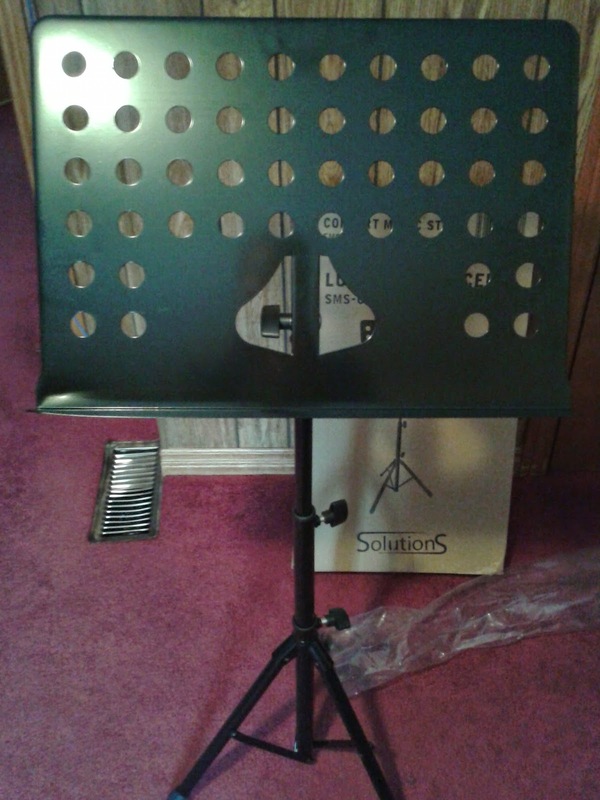 Then I had to figure out how to put the music stand together. It required a little head scratching, but no tools were involved. As there were no "constructions" in the box, I had to figure it out on my own. It took about 10 or 15 minutes of fumbling with the parts, but in the end I had a functional stand! 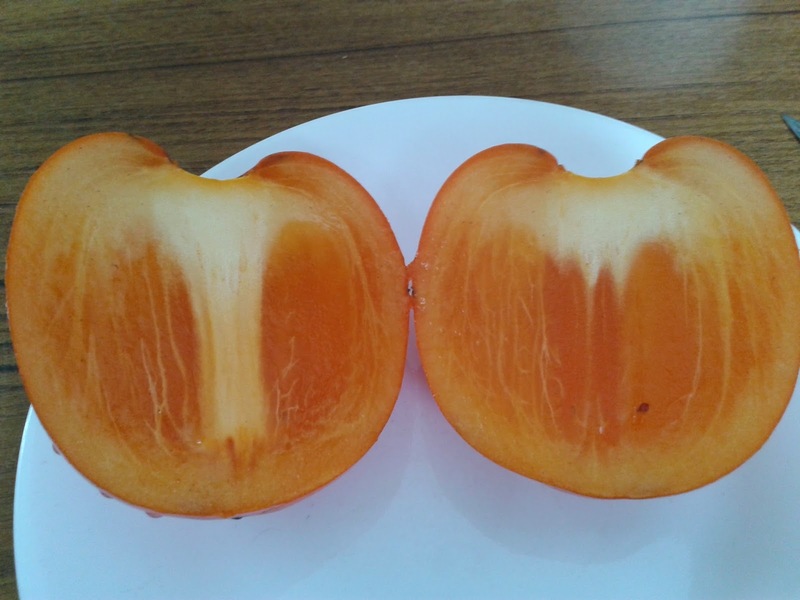 I also tried a persimmon on Monday. You're probably like "What's a persimmon?" And I be like "Oh, I don't know!" They were on sale at No Frills, so I bought one over the weekend and checked online how to eat this fruit. After the first half, I figured out eating out the inside with a spoon worked best. What does it taste like? Oh, I don't know. There's nothing to accurately compare it to. It's kind of like a mango, and the flavour is sort of like an apricot. I know. That makes no sense. You pretty much have to try it to know. January 13: I made oat biscuits for lunch. I have only made biscuits once before, so I'm a very amateur biscuit baker. The dough had rolled oats and oat bran in it. Mixing that up was easy. It was patting out the dough and cutting biscuits that proved to be a little more difficult. After assessing my sticky mess and knowing there was no way I was going to be able to cut out and transfer dough to a baking dish looking anything like a biscuit, I declared the first attempt a practice round, scraped my dough back into the bowl, and started over using a little more flour. The end result certainly didn't look impressive at all, but they tasted a lot better than they looked. 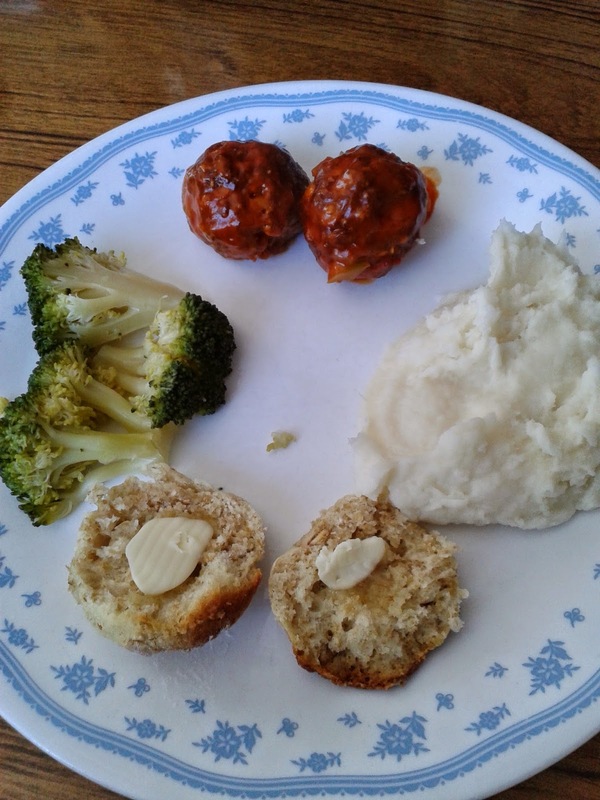 They complimented the meatballs, mashed potatoes and broccoli reasonably well. In the afternoon, I had to write an English exam, and then use up some time before going to work. So I headed to Slice of Aylmer Deli & Imports to search for a type of Dutch candies, and was successful in my search. I had never been in there before and needed some of these candies for one of my new things to do. But you will have to check back next week to see what that's all about. I'm hoping to do a video of that one, and I think it will likely be worth checking back for. Then I headed to a craft store in town to look at what they had available for another one of my plans. I can't do everything right away. I have to space my ideas and spending. And I can't have seven days of new food related things going on here. So you have to wait for some. 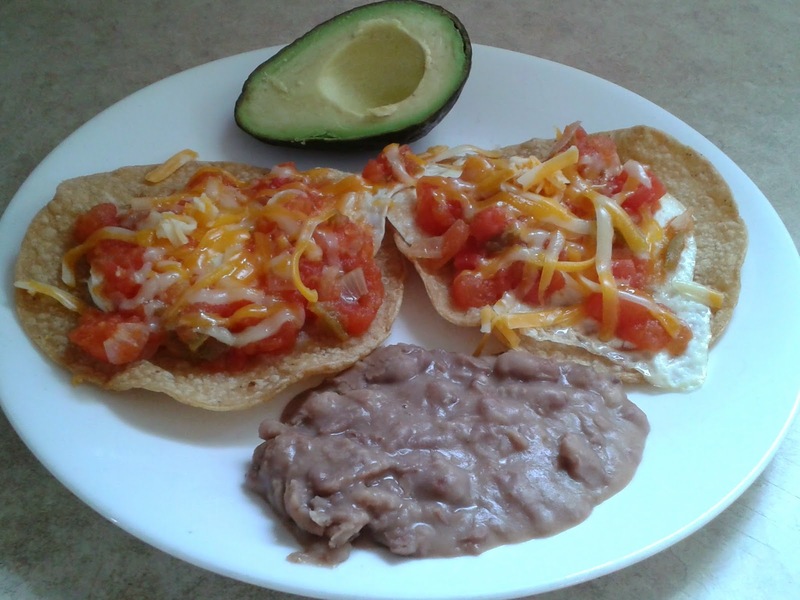 January 14: I made Huevos Rancheros! 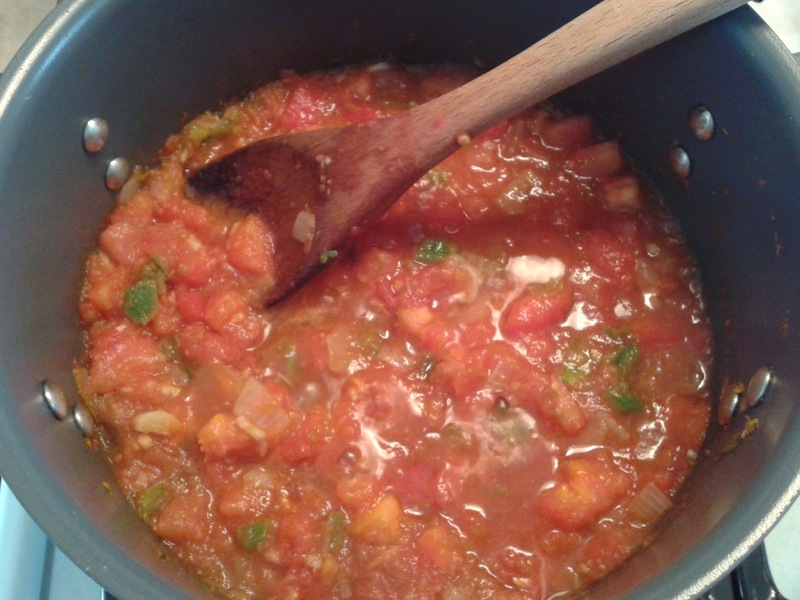 I had never had this before, but I had thought about making it a lot and just never done it. As I'm writing this, I'm having a cup of tea after enjoying this pretty awesome lunch. Huevos Rancheros is a Mexican breakfast dish made of tortillas, eggs, cheese, and a sauce similar to salsa. But breakfast is good any time of the day. I used a recipe, but also took some tips from my sister who makes this quite often. Definitely going to have this again. The crunchy tortillas made me wish I had made some chips while I was at it. And the end meal with refried beans and avocado. Fat and protein. Mmmm. Another week down. Only 50 to go! Labels: cooking, food, fun facts, music, sports, What Did I Do?